With Spring around the corner and as more people start heading in to the countryside, Lauren Dean takes a look at what steps farmers can take to keep their farm safe from trespassers. Not long after a farmer caused uproar when he took steps to conserve the safety of his farm by covering his land in cameras, the industry called for more transparent information about how they can monitor trespassers on their land. It came following the results of a survey by Cornish Mutual, a south-west rural insurance company, which found public footpaths and trespass were the most critical issue with regard to on-farm health and safety. Many farmers suggested they needed better clarification on what they could – and could not do – on their own land. CLA access adviser Sarah Slade and CLA legal adviser Andrew Gillett joined forces to issue advice and safety tips to help farmers on how best to safely, responsibly and legally manage walkers on their land. When can a farmer tell somebody to leave his land? Where a person enters farmland without permission or with no form of legal right to do so, they become a trespasser. Although farmers or landowners can attempt to remove trespassers, it is not always advised: “You do not want to find you have committed a criminal offence for using excessive force on a person you would like to leave your land," CLA legal adviser Andrew Gillett said. However it must be remembered that trespass is a civil offence and the police will not assist. When does a farmer owe a duty of care? With regard to duty of care, farmers must turn to the Occupiers Liability Act 1984 which sets out the position with regard to trespassers. This includes people who stray from the right of way onto adjoining land. But the level of liability a farmer owes a person on his land depends on the reason they are there. When holding livestock in fields adjacent to public rights of way, farmers must be alert to the dangers cattle and other animals can pose to members of the public, and the risks that may arise from even apparently docile animals. In terms of what livestock are allowed, farmers are banned from keeping specified breeds of dairy bull in fields crossed by a public right of way. These include: Holstein, Fresian, Ayrshire, Dairy Shorthorn, Jersey, Guernsey and Kerry. It must also be noted that beef bulls over ten months old can only be kept in fields crossed by public rights of way if they are kept with cows and heifers. REMEMBER: Whilst there remains a low level of liability where people are using the right of way, if a person wanders from the legal route a farmer may then owe a higher duty of care because they have become a trespasser. 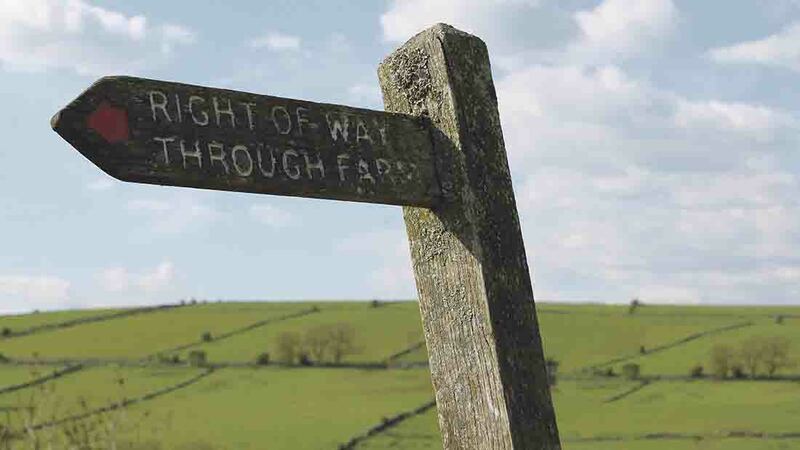 It is important to clearly signpost rights of way to encourage walkers to stick to the route. A farmer or landowner cannot use fencing to prevent a person using a public right of way or they face being taken to court for causing an obstruction. He is, however, able to fence his land to prevent unauthorised access. Temporary fencing may be used to separate land from a right of way so long as the path remains open for the public to use. A farmer can make a request to the highway authority to divert a path, but because there is no obligation to process applications to change the route of the path it often can – and does – take a while before an application is looked at. The new route must be enjoyable and convenient for the public, so farmers are advised to think about the surface of the path and how easy it is to walk on, the number of gates and how pleasant the new route would be to walk compared to the existing one. As lambing season is around the corner farmers are urged to look closely at the legal rules surrounding walkers and their dogs. With reports that loose dogs were responsible for 15,000 sheep deaths in 2016, experts advise landowners should be fully aware of how they can deal with dogs on their land. “Although there is no specific legal right to take a dog on a public right of way, it is likely that should it ever be challenged, a dog would be considered to be a ‘usual accompaniment’ to a walker and consequently that a walker is entitled to take a dog with them on a public right of way," Mr Gillett said. Landowners are able to apply for the exclusion of dogs from fields where sheep are kept at lambing time, as long as the enclosure is smaller than 15 ha (37 acres). If a walker does not comply with the restrictions on access and rules concerning dogs, then they have no entitlement to be on that land and are effectively a trespasser. The landowner can therefore ask that person to leave the land. When should a dog be on a lead? But if CROW land is crossed by a public footpath, the rules change. Here, where a walker uses a public right of way to cross open access land, only the right of way rules apply. This means if the dog owner follows the line of the public footpath on CROW land, there is no statutory requirement for him to have his dog on a lead. There is a provision in the Protection of Livestock Act 1953 that allows the farmer to shoot a dog which attacks or chases his livestock. Where a field is home to sheep or other livestock, a dog must be on a lead or under close control.